Heat oven to 375°F. Lightly grease 2 cookie sheets with shortening or cooking spray. Remove dough from both cans. Unroll dough onto cookie sheets; press perforations to seal. Using 2-inch-round cookie cutter, cut 12 rounds from each can to make a total of 24 rounds. Bake 8 to 10 minutes or until golden brown. Remove from cookie sheets to cooling rack. Cool 5 minutes. 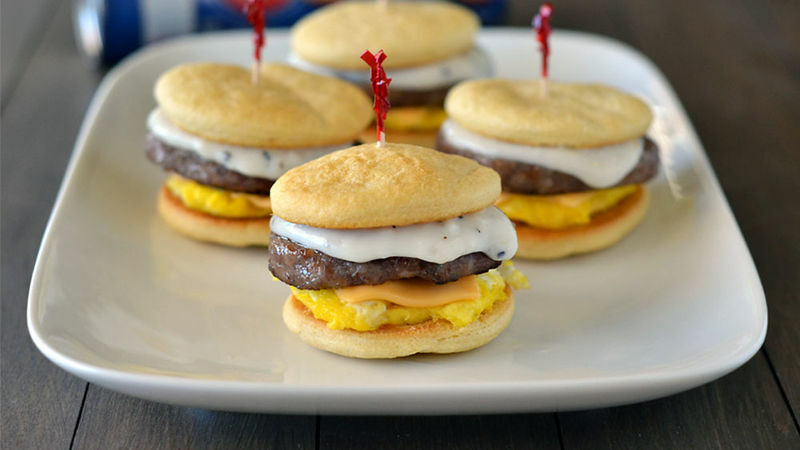 To make each slider, top each of 12 baked crescent rounds with 2 tablespoons scrambled eggs, 1 quarter slice cheese, 1 sausage patty and 1 tablespoon country gravy. Top each with another baked crescent round. Serve immediately. Use turkey-sausage for a leaner breakfast slider. Try using Colby-Jack cheese to turn up the heat!